For years, poker books, articles and training videos taught us that we can’t flat a whole lot with shallow stacks because we don’t get to realize our equity that often. We still miss the flop around two thirds of the time, and when we don’t hit, we can’t really do anything because we are too shallow to try check-raise bluffing and so on. The education material always advocated that whenever we have a strong enough hand with a shallow stack, we should just go all-in. That way we’ll always see all five cards and won’t get blown off our equity. While there’s a lot of merit to this strategy, I don’t believe it to be anywhere near optimal from one position specifically: the big blind. In the first part of this article series, we discussed defending the big blind against a late position open with a resteal stack (around 15-20 big blinds). But where do you draw the line between a resteal stack and a “shove and pray” (meaning that you’re so short that you’ll always get called) stack? The answer, if you ask me, is almost never. I don’t believe there’s really any stack above ~3BB that you need to treat as an all-in or fold stack. Big Blind shows and holds. Being shallow-stacked actually allows Villain to realize more equity because they will see all 5 cards more often. It will be easy for Villain to play his hand post-flop with such a shallow stack. When you have something like 30 big blinds, flatting a hand like 6-5 from the big blind often becomes a bit difficult. So often the flop comes like K-J-5, and you call a c-bet because you have a pair. If the turn is virtually any card besides a five or a six and your opponent bets again, you have to fold. You didn’t get to realize your equity, because you were too deep to see five cards. But what if you had just five big blinds to start the hand? You’d always get to see all five cards when you hit something by getting it all-in with any piece (you’ll be priced in if you hit almost any piece.) At the same time, you can save your last few BBs by getting away when the flop is A-K-J. Villain raises to 2,200 on the Button, Small Blind folds, Hero ??? Let’s estimate Villain’s Button opening range to be 37.3%. It’s best to estimate a slightly tighter opening range than usual because of our short stack. You can give him almost any halfway reasonable range, though, and it won’t change what I think is by far the best option here. We’ve completely whiffed the flop. We check, our opponent bets and we fold. There are very few hands that we are beating, and even a hand like J-T is a pretty big favorite against us. Whenever our opponent has an ace or a king, we’re basically dead. We only have 8.33% equity against our opponent’s opening range, so folding isn’t painful at all. We clearly had the odds to call pre-flop with our hand, and now that we whiffed we can muck our hand without thinking twice. Had we gone all-in before the flop, our opponent would’ve called and we’d find ourselves more or less dead on the flop for the last of our chips. In this scenario we saved our last 5,300 chips by not shoving pre-flop. We’ve flopped huge for a 5 BB stack. We could shove ourselves, or check and put the rest of our chips in against a bet of any size. We’ll force the Button to fold many hands with decent equity against us, like QJ. We’ll induce the Button to call with many worse hands, like AK. It’s almost irrelevant to us what he does with something like K-Qo. If he calls, he only has 22.8% against us, so we’re a big favorite to double. If he folds, then cool – we just won a big pot without showdown and now it’s our opponent who didn’t get to realize his equity! Also, if we decide to check we may induce a bet/fold from out opponent because it’s a brick flop that people c-bet virtually 100 percent of the time (especially in MTTs, where people generally c-bet too much). When we shove over the bet, he can either fold out his equity or call with a hand that’s behind. That’s a mistake he never would’ve had a chance to make had we gone all-in before the flop. This is probably as close to a hairy-looking spot as it gets with these stacks. We have 34.71% against villain’s opening range. If we check and he goes all-in, we can actually call. We need 32.3% equity, so it’s quite close. However, being out of position with stacks this short is actually favorable because you get to make the first move and there’s nothing your opponent can do about it. This allows us to play the hand even more profitably. What’s our equity when called? How often will he call? Button’s call range vs our shove. I basically only have him folding the flop with stuff that’s completely whiffed, such as K-4s, J-To, and A-7o. 2) Still win the pot 32.4% of the time when we do get called. Pretty sweet deal, eh? We only flopped a gutshot with no overcards, yet we still profited 0.84 big blinds on the hand (had we folded before the flop, we’d have been left with 6,500)! Remember how much that pre-flop shove would’ve made? Yep, 0.04 big blinds. I think we’re onto something here. We’ve flopped pretty well and will almost certainly be playing for our stack here, granted we aren’t fist-pumping about it. I think we could either lead-shove or check and let our opponent bet first. If he goes all-in, we call, if he bets anything less than all-in, we still push. Which of the options is better is actually a fairly interesting question, and depends a lot on how often your opponent c-bets. Without doing the math, I think I actually lean towards checking because that gives our opponent more opportunities to make a mistake. But just to illustrate one last point, let’s look at if we just always donk-shoved this flop. On this texture, our opponent has a pretty easy decision with most of his hands: If he has a pair of eights or better, he’s never folding, and same goes for a flush draw. I’m also giving him credit for being an absolute clairvoyant where he folds every single worse pair and calls with every single better one (and 87s for a chop). This is, essentially, as bleak as it can possibly get for us. The black symbols mean spade combos only. = 8045 chips on average. I almost hope that none of you will actually follow the advice in this article, because dealing with super-short-stack flats and donk-shoves is miserable and annoying. There are few scenarios more tilting than when you get dealt A-K on the button, open into a short stack ready to take the last of their chips, and then he ****ing flats and lead-shoves a T-8-5 flop. But that’s exactly why it works so well. You see the power of having position being discussed to no end in poker articles, but when you’re super-short, being out of position is actually a big advantage. When you only have something like 1x pot-sized bet behind, whoever gets to pull the trigger first always gets to put the other one in a nasty spot with a lot of their range. Yet at the same time you get to play your own hand to perfection. You could even just play a very silly strategy of always donk-shoving when you have a pair+ or a draw and check-folding the rest, and there wouldn’t be a damn thing your opponent could do about it. He’d frequently be forced to fold boatloads of equity and a bunch of actually best hands on various textures. In reality, you can exploit your opponents even more by playing a bit more unbalanced – trapping with your monsters, check-shoving instead of donking against people who c-bet too much, etc. It’s also noteworthy that as funny as it sounds, people just aren’t used to playing 7BB deep post-flop poker. You frequently see people shoving ridiculous hands that have virtually no equity when you check it to them with top pair. 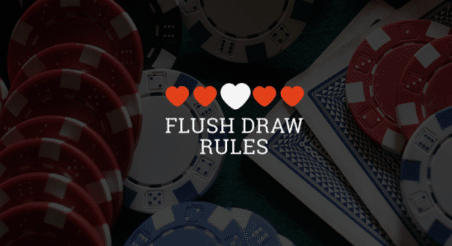 How much exactly they should shove in these scenarios depends on a lot of factors, but the answer is by no means 100 percent, and we only allow our opponent to make those mistakes when we flat pre-flop instead of going all-in. Ask yourself this question: You have 50 big blinds and open the button with A-4o into a big blind with a stack of 7 big blinds. He calls, and you have 1x pot-sized-bet behind on a flop of T-8-2. Your opponent checks. What do you do? The answer is: I don’t know. You should mayyybe just shove, because you just have 1xPSB behind anyway, who cares about 5 more big blinds when you have so many. You might have the best hand and you really want to make him fold something like 7-6 that actually has a lot of equity against you. But then again, if the big blind has trapped with, say, T-9o, you’re drawing almost dead. Also, if the big blind had donk-shoved into us, would you call? As you can see, the big blind has just made our life absolute hell by flatting. An important side note is also that since people virtually always open A-x hands over other non-pair hands (for obvious reasons), it actually makes it pretty hard for them to smash most flops without an ace in them. For example, ~38% of the button opening range we used before has an ace in it. All those A-x hands just really hate their life with awkward stack to pot ratios on two thirds of the flops (especially when you have 1.5x pot or so behind). How Wide Should We Flat From the Big Blind? Alright, so we’ve now concluded that we can flat a lot of hands in the big blind, because we can (simplifying it slightly) just play fit or fold after the flop. Should we just flat all of our hands, then? Of course not. As you can see, shoving a hand like 2-2 or A-4o makes over 1.1 big blinds in our 7.5BB deep example. I would always just jam these, because that’s a huge equity advantage, and I’d hate my life on virtually every flop we didn’t bink. But when you look at those smaller edges like J-8s or K-6o, as well as some losing shoves like 6-5s or Q-8o, I’m pretty convinced that flatting is much better. I don’t know where exactly to draw the line, but unless you’re somehow really screwing things up post-flop, I’d say that in this example you could easily flat at least every hand that’s between -0.25 and +0.25BB and do better than you’d do by just shoving the +EV ones and folding the rest. I wouldn’t be shocked if you could even flat hands as weak as 8-5s. The third installment of this series will cover blind vs blind showdowns from the small blind’s point of view — read it here. As always, I’ll be happy to answer questions in the comments box below, or on Twitter @chuckbasspoker.